I logged in to make a quick and easy change to the font of one my live forms (to use a system font instead of a Google font). After I did that, the entire design (font sizes, font colors, submit button colors, etc.) is now completely wrong. I've tried several times to edit using the Advanced Designer. The design settings are showing correct (white label text, 24 point text font, transparent form background, blue submit button, etc.) but the form itself isn't showing it. It seems that this issue seems to be form specific. I have tried creating a new form and when changing the properties from the Form Designer, it is displaying correctly. If you have applied a theme to the form, it may be also overriding the changes on the form. 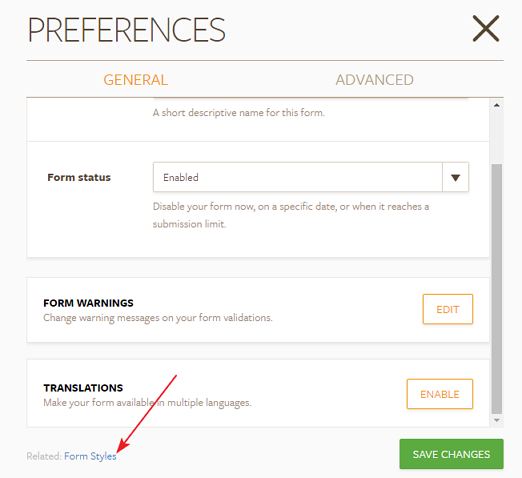 Could you try changing the form design from the Form Styles in the Form Preferences and see if that works? I am able to see the changes made from here to the cloned version of your form. Please give it a try and let us know if you need any further assistance. We will be happy to assist.